Update: With the passage of time—one calendar day, in this case—I can now say that this hint is wrong. Photos does not respect partial day values. 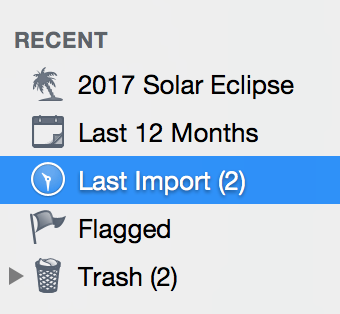 Instead, any value less than one is rounded to zero, so all you can really do is create a Smart Album that finds imports you made during the current calendar day. That is, Date Added – is in the last – 0 – days. This is what I’m using now, as it’s better than one day, which actually shows two days (today and yesterday), but it’s not as nice as iPhoto’s Last Import album. I’ve left the hint up, because it’s been linked to and tweeted a few times, but it’s wrong. Sorry for the lack of testing before I posted it. After writing up my iPhoto to Photos migration adventure, I realized there was another iPhoto feature I relied on that has gone missing in Photos: The Last Import entry in the Recent section of the sidebar, as seen at right. At first glance, Photos seems to have the same thing, as there’s an Imports entry in the Library section of the sidebar. But it’s not the same: It’s just a view of everything you’ve ever imported, with the newest at the bottom of the section. I like being able to work with just my most-recent batch of imports, as it makes it really simple to work through each image that I keep, adding tags, etc. There is one oddity: Photos doesn’t seem to be expecting a decimal there, so it can’t display it after creation. If you edit the Smart Album, the time will display as zero. But the value is still there—even if you click OK to exit the dialog, your Smart Album’s timing won’t be updated to actually be zero. After some experimentation, I went with .083, or two hours, as that gives me enough time to finish my first-pass reviews and edits before the photos vanish from the Smart Album. This works with both Date Added and Date Captured, providing much greater control than the default of full days.